Thomas Leo "Tom" Clancy Jr. (April 12, 1947 - October 1, 2013) was an American writer and screenwriter. His books are thrillers about politics, spys and the military. Most of his books include many technical details about their subjects. Seventeen of his novels were best-sellers, with over 100 million copies in print. His stories take place during and after the Cold War. He owned with some other people a Major League Baseball team. Clancy also produced popular video games. Thomas Leo Clancy Jr. was born on April 12, 1947, in Maryland. He finished school 1965. After school he studied English Literature at Loyola College in Baltimore and finished that in 1968. He said he studied English because he was not smart enough to do physics. Clancy married his first wife, Wanda, in the 1970s. They have four children together and separated in 1998. In 1993, Clancy bought with some other people the Baltimore Orioles (Baseball team) from Eli Jacobs. In 1999, Clancy, at age 52, married the 32-year-old writer Alexandra Marie Llewellyn, on June 26. Llewellyn is a distant relative of Colin Powell. Clancy is known to have been politically conservative, and gave over $200,000 to Republican Party politicians. Clancy died October 1, 2013, after a brief illness at Johns Hopkins Hospital, near his Baltimore home. No cause of death was released. Clancy is survived by his wife, Alexandra; their daughter, Alexis; and four children from a previous marriage to Wanda King: Michelle Bandy, Christine Blocksidge, Kathleen Clancy and Thomas Clancy III. His cause of death was later confirmed to be heart failure. From the books The Hunt for Red October, Patriot Games, Clear and Present Danger, and The Sum of All Fears films were made, that many people wanted to see. The first NetForce book was filmed for television. The website IMDB says that Tom Clancy's novel Without Remorse is to be made into a movie in 2008. No other details are available (27 June 2007). Only two books of Clancy are not with Jack Ryan and/or John Clark. ↑ 1.0 1.1 1.2 Bosman, Julie (2013-10-02). 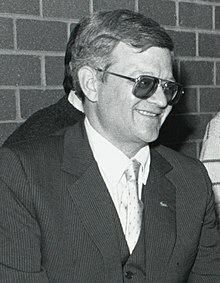 "Tom Clancy, Best-Selling Novelist of Military Thrillers, Dies at 66". New York Times. Retrieved 2013-10-02. ↑ "Tom Clancy, author of 'Hunt for Red October' and 'Patriot Games,' dead at 66". New York Daily News. Retrieved 2 October 2013. ↑ US Naval Institute Staff (2013-10-03). "Tom Clancy Dies at 66". US Naval Institute. Retrieved 10 October 2013. "Something for the Boys" by Christopher Hitchens, The New York Review of Books, November 14, 1996. A review of Clancy's Marine: A Guided Tour of a Marine Expeditionary Unit. This page was last changed on 11 June 2018, at 08:35.